What Derocher and Stirling don’t say in their polar bear employment summary is that virtually all of those permanent jobs are government gigs, with paycheques coming out of national or regional coffers. In the USA, government employers are US Geological Survey (USGS) and US Fish & Wildlife Service (USFWS); in Canada, Environment Canada, Ontario Ministry of Natural Resources, Government of Nunavut; in Norway, Norwegian Polar Institute and National Environmental Research Institute; in Denmark/Greenland, Department of Arctic Environment and Greenland Institute of Natural Resources; and in Russia, All-Russian Research Institute for Nature Conservation and Wrangel Island State Nature Reserve (Obbard et al. 2010). A few polar bear biologists hold university positions (like Andrew Derocher, University of Alberta, Edmonton and Gregory Thiemann, York University, Toronto) or museum jobs (like Øystein Wiig, Natural History Museum, Oslo), which are also largely funded by governments. These government jobs allow the biologists to plan their research and write reports and papers for academic journals. But the money for fieldwork each year comes largely from outside grants funded by governments, like the National Science Foundation (USA) or National Science and Engineering Research Council (Canada), to which all scientists in the country must apply (and usually run for 3-5 years). But doing fieldwork with such large carnivores requires many bodies on the ground. Much of the physical work on polar bears is carried out by graduate students funded from research grants awarded to those with permanent jobs. Most government employees also do collaborative research with university professors and some, like Ian Stirling did before he retired, have university affiliations and a government job. This situation is not much different from many other fields of biology. 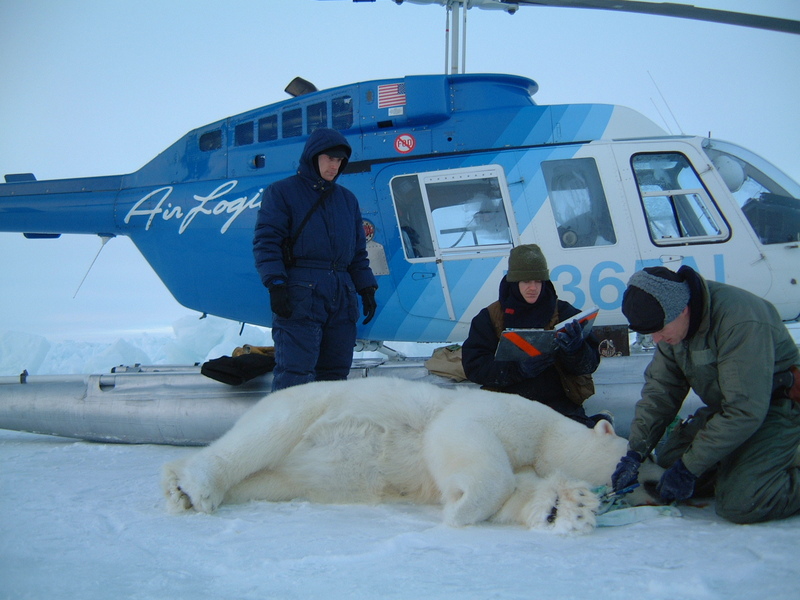 The difference for polar bear research is that Arctic studies are very expensive – helicopter time and jet fuel, for example, are considered necessities for most projects (Fig. 3), and have been since at least 1980 (e.g. Ramsay and Stirling 1988). The cost of helicopter support adds up very, very quickly. Figure 3. Arctic research routinely includes helicopters and the jet fuel to fly them. Here biologists work on a bear in the fall of 2001, probably somewhere in the Southern Beaufort. Steve Amstrup photo, USGS. Courtesy US Fish and Wildlife Service. That’s right — almost $12,000 per hour for a helicopter. Government grants are competitive, however, and can’t be counted on to come through every time. Polar bear researchers have often had to find outside (non-government) funds to continue gathering critical long-term data. In the early 1970s and 1980s, most of this outside money came from companies engaged in Arctic oil and gas exploration, particularly in the eastern Canadian Arctic (Featured Quote #45) and the Southern and Eastern Beaufort. 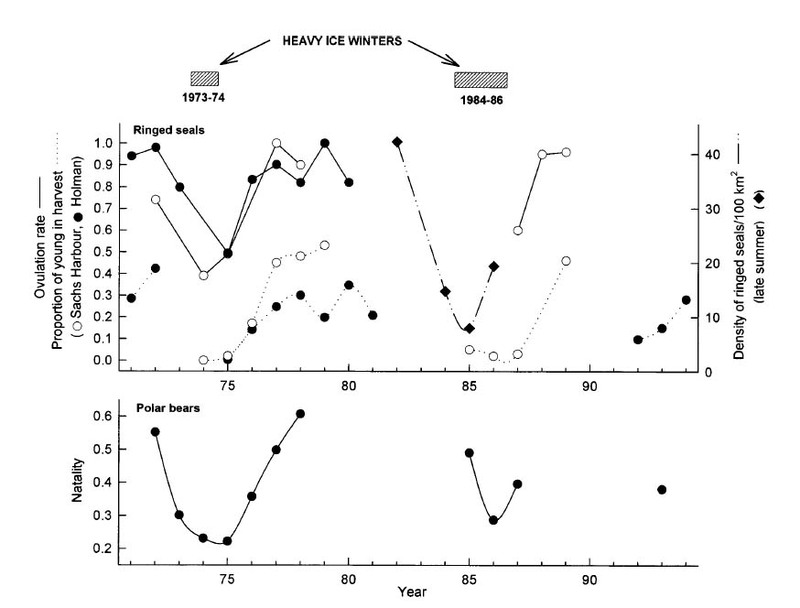 Despite the oil and gas money, however, gaps in long-term polar bear data sets (e.g., Fig. 2 in my November 19th post on Hudson Bay, as well as Figs. 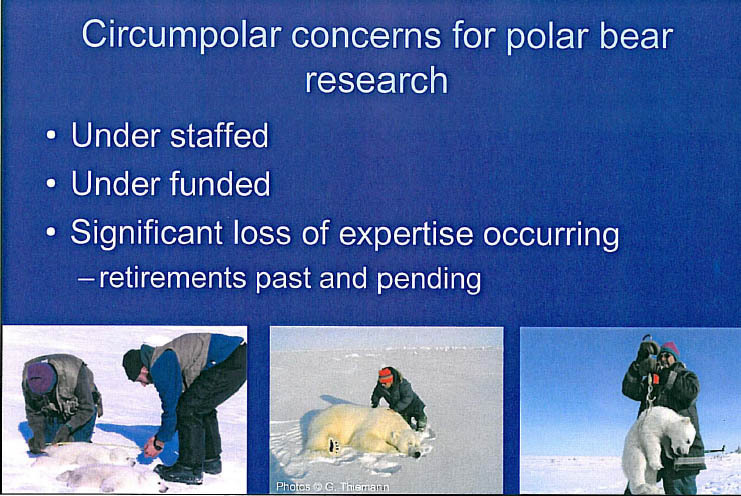 4 and 5 below) suggest that money for fieldwork has often been tight for polar bear studies. Figure 4. Gaps in the polar bear data (1980-1984; 1990-1999; 2001) suggest no money for field work some years in the Northern Beaufort. From Stirling et al. 20011:871). Figure 5. 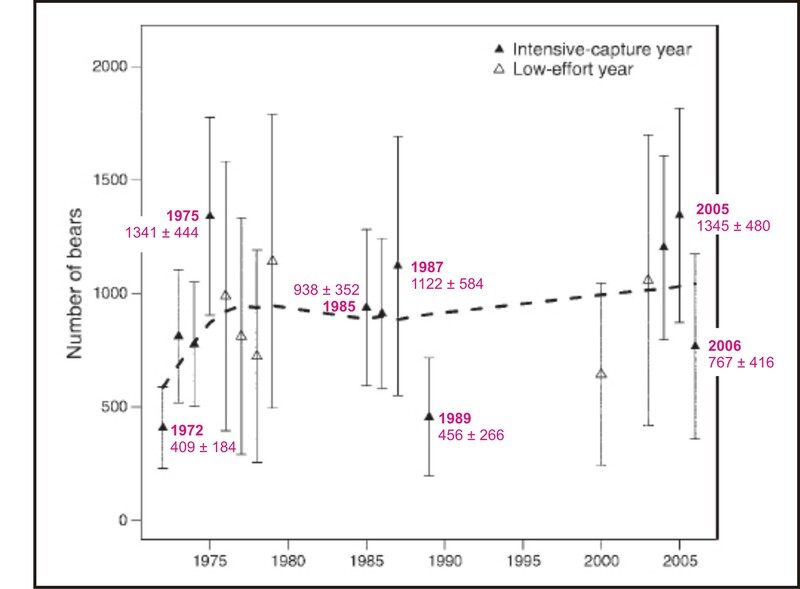 Gaps in the polar bear data, lower panel (1979-1984; 1988-1992; 1994) suggest no money for field work some years in the Eastern Beaufort. From Stirling 2002:69). A few small research grants come from organizations like World Wildlife Fund (WWF) and the Coca-Cola Company (discussed here) but those “top-up” government grants, they don’t replace them. 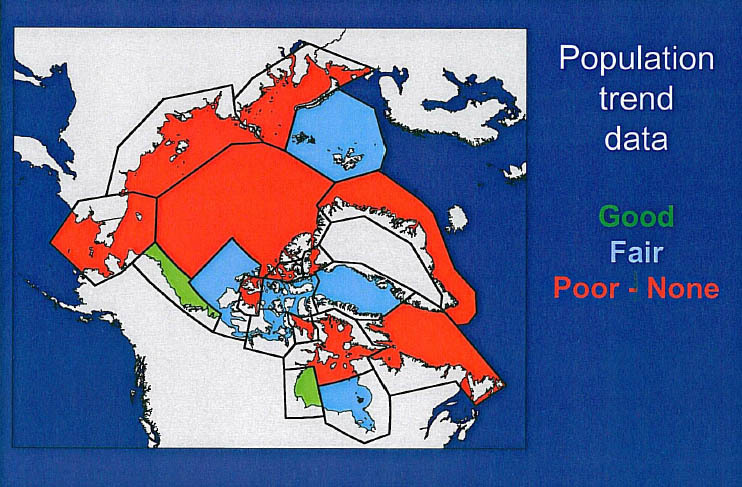 Funding issues are at least partly to blame for the fact that after 40 years of research, only two subpopulations (Southern Beaufort and Western Hudson Bay) have good long-term polar bear population data (Fig. 6). However, in recent years, concerns about possible effects of global warming on Arctic sea ice has generated some much-needed government funding for polar bear research but particularly in Canada, the situation is still far from ideal. How could anyone expect that polar bear researchers would not want this situation to improve, not just for themselves but for students just starting their careers? Having a designation of “threatened” or “endangered” automatically makes more government funds available for any species: more permanent jobs, more dedicated grant funds and much improved chances of being awarded large research grants. Is it all that surprising, then, that Canadians Andrew Derocher, Ian Stirling and others, are defending so fiercely the notion that global warming is now a huge threat to polar bears (Fig. 7)? Figure 7. 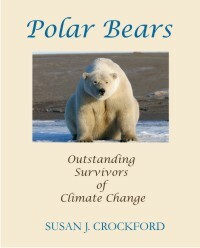 From Derocher and Stirling 2011, invited speaker presentation to the 2011 Polar Bear Meeting in Nunavut, Oct 24-26. 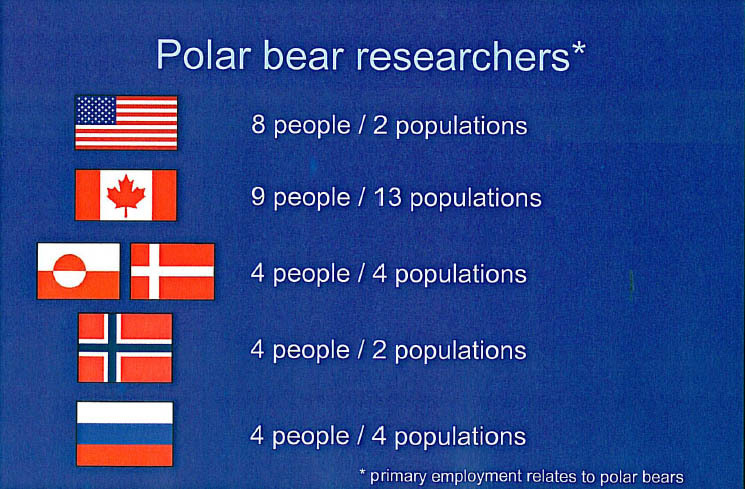 Another aspect of this issue that needs to be raised is this: polar bear researchers love their jobs (Fig. 8). 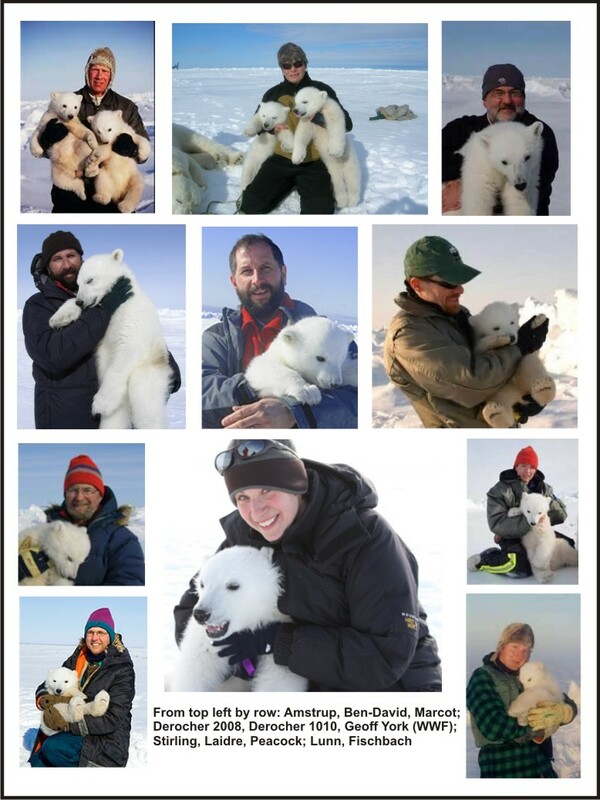 Virtually all polar bear biologists are conservationists by training, and they not only care about polar bears, they love working with them. Does this emotional attachment significantly affect their scientific objectivity? I think it’s a question that should be asked because it makes the issue even more complicated. Figure 8. Don’t these photos say “these people love their jobs”? From material included on employment websites, news stories, or provided as promotional material. Click to enlarge. 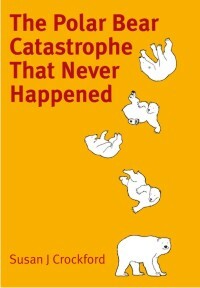 But let’s keep it simple: given the precarious nature of funding for their chosen careers – which they themselves acknowledge – is it really possible to disconnect the concern polar bear researchers profess for the long-term survival of polar bears and their private worries over future employment? Are polar bear researcher protecting the bears or their own jobs? Is there not an obvious, built-in conflict of interest? As a consequence, shouldn’t the expert testimony of polar bear researchers who proclaim global warming to be a monumental threat to polar bears be taken with a large grain of salt by government representative participating in international conservation forums, like the meeting taking place next week in Moscow? This issue also leads back to the topic of yesterday’s post. 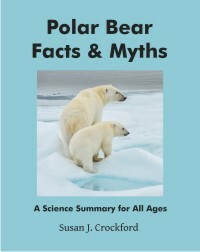 I ask you this: Isn’t the government of Canada, with 2/3’s of the world’s polar bears distributed over a huge area, in fact absolutely correct to consider all stakeholders and all expert advice — not just IUCN Polar Bear Specialist Group delegates like Derocher and Stirling — when assessing the conservation status of polar bears in Canada? Wasn’t it entirely sensible and responsible of the panel of Canadian scientists at COSEWIC in 2011 to avoid being overly swayed by the opinions of polar bear researchers? Derocher, A. and Stirling, I. 2011. 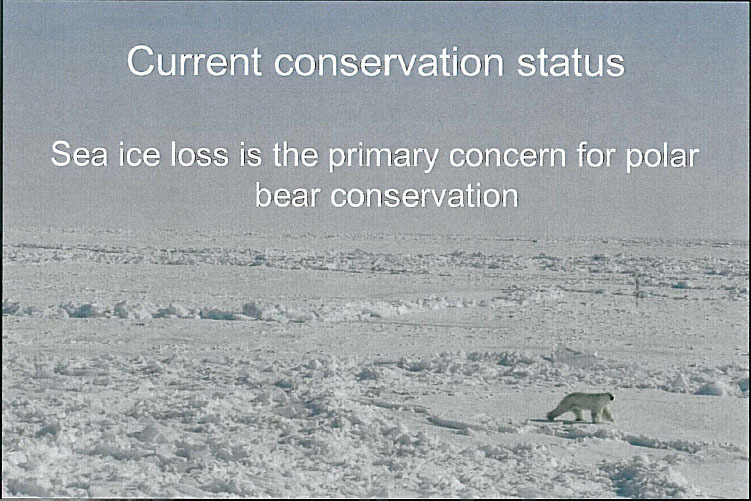 Conservation status, monitoring and information gaps. Invited speaker presentation to the 2011 Polar Bear Meeting in Nunavut, USA contingent. Oct 24-26, 2011. This entry was posted in Advocacy, Conservation Status and tagged 2011 polar bear meeting Nunavut, Circumpolar Action Plan for Polar Bear Conservation, conflict of interest, conservation, COSEWIC, Derocher, Eastern Beaufort, expert testimony, government jobs, grant funding, helicopter survey, jobs, oil money, polar bear research, Southern Beaufort, Stirling, western hudson bay. Bookmark the permalink.